When you answer the door this Halloween, there’s an extremely high likelihood that you’ll be dropping candy into the bags of Elsa, Olaf, Raphael or Donatello. Wait a sec. Those aren’t the names of your neighbors’ kids. They are, however, the names of this year’s most popular Halloween costumes—the trademarked, copyrighted, branded kind. According to a just-released study by the National Retail Federation (NRF), much of the $2.8 billion that’ll be spent on Halloween costumes this year will go to purchase characters straight from the multiplex. Some 2.6 million kids are expected to don costumes from Disney’s Frozen, and roughly the same number will dress up as Spider-Man. 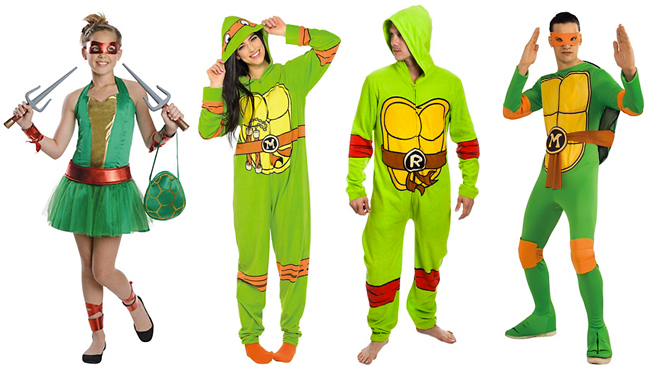 Another 2 million youngsters will hit the streets as Batman, while 1.8 million will wiggle into a green shell and go as one of the Teenage Mutant Ninja Turtles. Halloween itself—costumes, candy, decorations—is now a $7.4 billion holiday in the U.S., and not just for the kids. The NRF study also found that consumers actually spend more money—about $400 million more—on adult costumes. And, just for the record, we spend $350 on costumes for our pets. Another way of putting it: The money you’re dropping on the costumes your kids crave (the average price stands at just over 26 bucks) will basically wind up in the corporate coffers of Disney, Viacom, Warner Bros. and Marvel. It's a fact that some may find scary. But if you pine for the days when Americans made their own costumes, take heart: We still do. A survey conducted by CreditDonkey last year revealed that nearly half of us—49 percent—work on creating our own vampires, zombies, pirates and—who knows?—maybe even turtles.